Roll of the dice, the turn of a card, the toss of a coin. Life is still a gamble, even when the fix is in. We hit town with nothing but a hunch and our last sixty bucks. If we didn’t find Alton LaRue, we were screwed and would need to resort to the kind of petty crimes that’d landed us both in Huntsville. Ruidoso was a pretty place, high in the mountains and surrounded by thick forests. Thunderheads hung over the mountains reminding me of billowing sheets on a clothesline in my mama’s yard. It was cool too, much more so than it had been in Las Cruces where we had holed up after finishing a job in El Paso. It had paid well causing us to believe our future as professional hit men was bright. But no other offers of work came along. Between Gaff’s fondness for Mexican girls and whiskey, we burned through the money pretty quick. We sure as hell weren’t in Ruidoso for the scenery. Our intuition was right, we found La Rue working as a mutual clerk at Ruidoso Downs. When we knew him inside, he bragged about being involved with a crew that fixed races at The Fairgrounds in New Orleans. When the mob found out, a couple of LaRue’s partners ended up in barrels in the Gulf. The rest, including Alton, skipped town after hearing promises of what would await them if they were stupid enough to ever return. He was working at the fifty dollar window. After watching him for the first five races, our suspicions were confirmed. 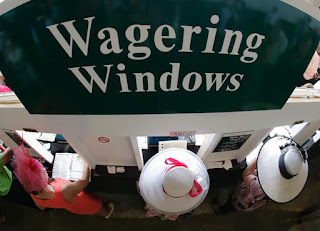 One minute before post time, he pulled down the shade on the window. 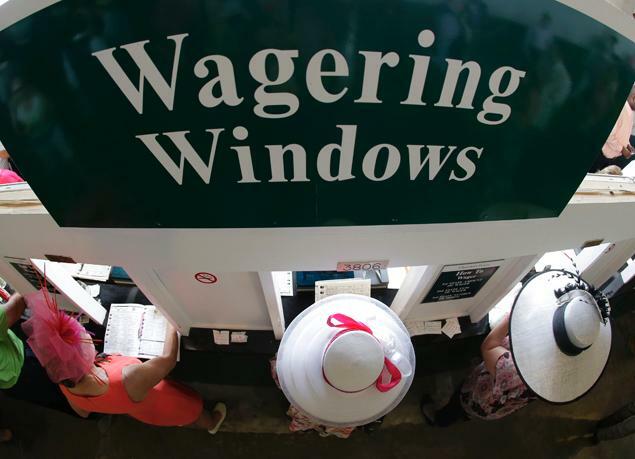 We stepped up close and when the gate opened, sending horses onto the track in a furious charge, we could hear him working the tote machine as fast as his fingers could fly. The tote spit out fifty dollar win tickets for a few more seconds. Ruidoso Downs is a quarter horse track. Most races are three to four hundred yards long and take somewhere from eighteen to twenty seconds to run. Hezadandy won that sixth race and paid $22.40 for a two dollar bet. Alton LaRue had a whole stack of fifty dollar tickets—enough to keep Gaff and me back in the black for a stretch. After the last race, we tailed him. He stopped at a little tavern on the north side of town. We waited a minute before walking in. There were only three other men, along with the bartender, in the joint. We sidled up on either side of him. There was a sweating bottle of Shiner and an untouched shot on the bar. “Consideren’ your good luck today, you might want to buy a drink for a couple of old buddies,” Gaff said. Gaff picked up the glass and downed the bourbon it contained. 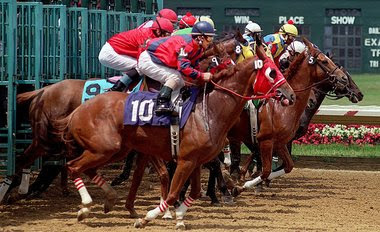 In quarter horse races, the horse that breaks in front usually wins. LaRue was in cahoots with the track electrician who had put a delay on the switch that turns the betting machines off when the gate opens. “And what would that be?” LaRue answered with a slight chuckle. Gaff fixed his ice cold smile on him. He tried to sound tough but there was nothing behind the bluff. He knew Gaff’s prison reputation. His hand shook slightly as he reached for his beer. We turned and left the bar. Alton LaRue was not at the track the next day and we were afraid we had thrown too much of a scare into him and he might have taken a powder. Our cash was running low. But he was back the following day. I went up to his window after the third. “Beat it, Fields,” he replied. I saw a single muscle twitch in his cheek. We followed him again after the races. This time he passed the tavern and turned off of the highway north of town. There was a little string of houses along a creek with large pine trees in the yards. He pulled into the last one. We waited and half an hour later he got in his car and started down the single lane road. Gaff pulled his Chrysler across the road, blocking it. We got out with guns drawn. LaRue had thrown his belongings in the back seat. La Rue pounded the steering wheel. “Give me the money.” Gaff ordered. He reached in his pocket and pulled out a thick wad of hundreds. “Th-that’s all of it” LaRue stuttered. Gaff didn’t believe in second chances. He shot Alton in the face. The rest of the cash was in the bottom of his grip. All together, it was over twenty grand. Gaff got behind the wheel, lit a Lucky and pulled out a flask. He fixed his low crowned straw hat on his head. Carl Perkins was on the radio. He passed me the flask, pointing the car away from the coolness of the mountains, toward the heat of the desert.